This season’s Emirates FA Cup competition prize fund is double that of last seaason and Yaxley FC are one of those non-league clubs hoping to cash in. 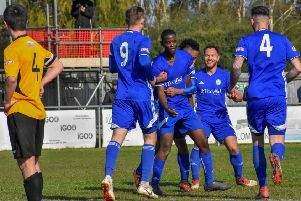 They have already picked up £2,250 following a convincing 3-1 away win against Eastern Counties League Division One North outfit Swaffham Town in the Extra Preliminary Round. They now know that a win tomorrow will secure another £2,890 in prize money to help with their ambitious projects on and off the pitch, all of which will positively impact the club and wider community in the years to come. The list of improvements they are looking to make include the construction of an additional 50-seater stand, the installation of new turnstiles, the building of a new gatehouse and resurfacing the club carpark. It’s the 138th edition of the world’s original cup competition this term, which saw over 1.8m supporters watch more than 11,000 players in action during last season’s campaign. All 368 clubs at the cup’s earliest stage were guaranteed a payment, regardless of their result. Winning clubs in the Extra Preliminary Round last season would have collected £1,500 from the prize fund, with losers taking home nothing. But this year, winners – including Yaxley – received £2,250 and losing clubs received £750, making a real difference to clubs across the football pyramid.